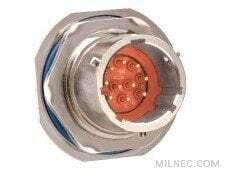 Bulkhead feed-though connectors have receptacles on both sides of the shell, allowing 38999 Series I compatible cable plugs to connect from each side. The pins and sockets can be arranged on either side to meet your design requirements. This hermetic version retains a true airtight seal for vacuum applications or pressure differentials.